Lucky isn’t so lucky…at least that is what I thought at the beginning of this first person narrative entitled Lucky Streak. He has been rescued, or perhaps captured would be a better word for it, by the military, after getting attacked by a zombie. He has already taken a drug to resist the effects of the zombie infection, and while the military monitors his progress in dealing with the viral battle going on inside his body, he is asked to tell his story, being told more than once that the information he shares could help save lives. That is when the real story begins. The author has created a story that moves along at a quick pace and gives us a chance to really get to know Lucky, who is just trying to make his way in the world both before and after the zombies come. He is a thief, but a good guy who helps those in need. He lives up to his nickname, Lucky, on more than one occasion, but it would seem given his overall circumstances, his luck isn’t all that it is cracked up to be. The story is entertaining and an easy read, and I was able to appreciate a story that comes from close to my neck of the woods, since I grew up in Kansas City, Missouri, not too terribly far from Lucky’s stomping grounds. I’ve probably only passed through Hutchinson, where most of the story takes place, once or twice in my life, but I could tell that the author has a good grip on the layout of his hometown and uses that to his advantage in this story. Overall, this is a fun and entertaining tale of one person’s life and times during the zombie apocalypse, both during the first wave of undead as well as the second. Zomblog II slides the reader into the story started with Zomblog with ease, with a second character having taken up the challenge to provide a journal about the ongoing zombie apocalypse. Meredith, who actually became the narrator perhaps halfway through the first book, continues to tell of her experiences as she moves from place to place and meets new survivors along the way, while trying her best to keep those she cares about alive. I thought the way the author shifted perspectives was quite creative and surprising in the first book. I won’t ruin the surprise here by giving away what happens in the second book, as I tend to prefer not to give away the overall plot. So if you are expecting the same type of shakeup here, you will have to read the book for yourself to find out what happens to the main character and if they make it through to the end. Zomblog II moves at the same breakneck pace as Zomblog did, but Todd Brown has upped the ante with even greater challenges and darker realities for the narrator of this tale to face as the initial days of the zombie apocalypse fade into the distance. The most compelling aspect of this book is the author’s willingness to show both the absolute best and worst aspects of humanity and keeping you glued to every page as the story unfolds. Make no mistake, this is a gritty, raw tale that expects the reader to accept how depraved mankind can get when things go bad. Certainly, there are those who retain elements of their humanity, but while living in barbaric, ugly times, the bad seems to shine through, and those that are willing to do anything are the ones who tend to survive. Not that there aren’t good people still around, but even those people are forced to do questionable, brutal things, including the main character. Perhaps the dark, dim nature of this tale might be too grim for some, and fair warning if you like coming out of a tale like this with a strong sense of hope. There is perhaps some, but nothing that will reaffirm your faith in mankind, that is for sure. Despite the fact that this is a diary approach to writing and there really isn’t dialog because of that, we are able to get to know Meredith and some of the key characters that surround her quite well and what drives and motivates them through her words and the emotions that resonate off her journal pages. Meredith is a fleshed out, hard nosed character that keeps the story moving forward every step of the way. This book kept my interest from start to finish, and I look forward to checking out how the story continues with the next Zomblog journal entry. It’s always really nice when an anthology you are in gets warm praise. It is even better when it is from one of the premier horror magazines in the business. But the icing on the cake is when they mention your story by name as one of tales they really liked. It is always flattering and humbling to receive praise like this. 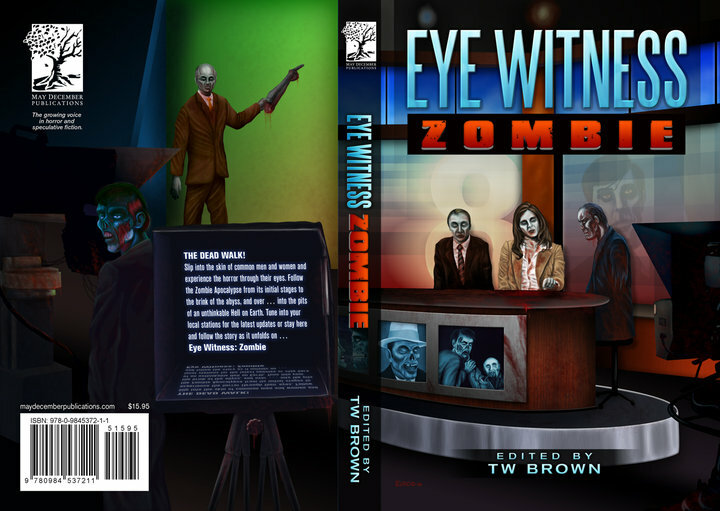 The fact that this particular story in Eye Witness: Zombie is tied into the world where my Dark Trilogy takes place is even more gratifying. So take a few seconds and swing by this link and check out the review for Eye Witness: Zombie from Fangoria! First review of Into The Dark! The first review of Into the Dark is up and I am pretty pleased with it. Todd Brown did a great job being honest with both his praise and criticism of Comes The Dark and does so again here. He does mention some confusion with the timelines, and that the second book jumps too far forward. The first book takes place six weeks after the apocalypse has begun, and the second book is just a couple of days after that. So I hope the confusion there isn’t something that causes problems with too many readers. If so, I apologize for that. Anyway, I just wanted to bring that up since it was a concern of Todd’s with this review and want to alleviate that concern as best I can.